The action at Mlali, German East Africa, on 24 August 1916 and the award of a Victoria Cross to Captain William Anderson Bloomfield of Van Deventer's Scouts. 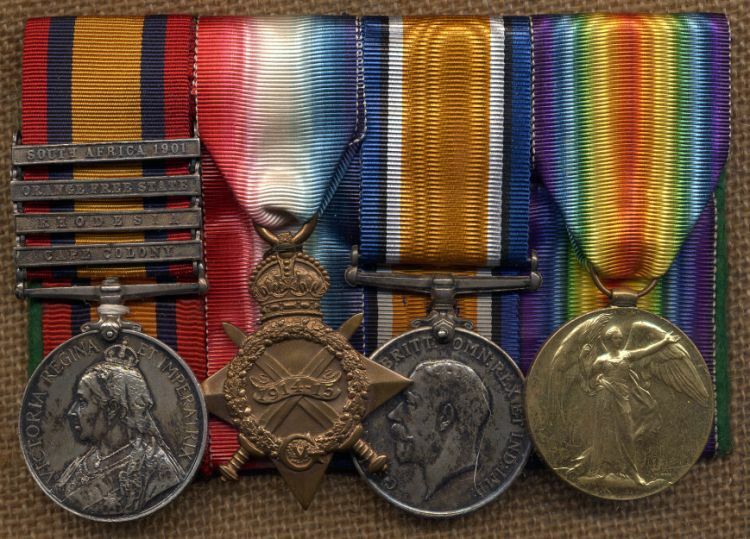 Above: The medals of Cpl. J. King, one of the men serving with Captain Bloomfield in Van Deventer's Scouts. In mid-August 1916 the British theatre commander in East Africa, General Jan Christiaan Smuts, optimistically planned to force main elements of Colonel Paul von Lettow-Vorbeck’s Schutztruppe into a decisive battle near the Central Railway in German East Africa. The British 1st Division under Major General A.R. Hoskins and the 3rd Division under Major General C.J. Brits had pushed south from the Pangani River towards Morogoro. Meanwhile the 2nd Division under Major General J.L. Van Deventer had marched on a broad front from Kondoa Irangi, cutting the Central Railway in three places west of Morogoro. South of Morogoro lay the steep and rugged Uluguru Mountains and General Smuts planned to cut the Central Railway to the east and block the routes on both sides of the Ulugurus, thus forcing the Schutztruppe to stand and fight near Morogoro. On 21st August 1916 General Smuts ordered the 2nd South African Mounted Brigade from 3rd Division to move from Dakawa to Mkata on the railway line to support 2nd Division’s advance from the west that was nearing Kilosa. The 2nd South African Mounted Brigade was commanded by Brigadier General B.G.L. Enslin and contained the 5th, 6th, 7th and 8th South African Horse, the 3rd Battery South African Field Artillery and a detachment of the South African Scout Corps commanded by the 43 year-old Captain William Anderson Bloomfield (Captain Bloomfield’s Medal Index Card names his unit as Van Deventer’s Scouts). 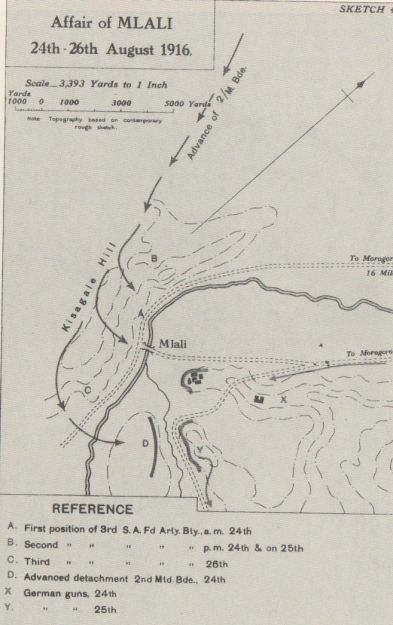 On the following day 2nd Division took Kilosa and so General Smuts ordered Brigadier General Enslin to move his brigade to Mlali and block the trail on the west side of the Ulugurus that led south to Kisaki. General Van Deventer was ordered to send his 1st South African Mounted Brigade commanded by Brigadier General A.H.M. Nussey to join Enslin as soon as possible. However Nussey’s brigade was exhausted and many horses had died or broken down and the brigade did not arrive at Mlali until 26 August. Enslin’s brigade reached Mlali at around 0730 hours on 24 August and 5th, 6th and 7th South African Horse were ordered to occupy Kisagale Hill which overlooked the route south to Kisaki. German outposts on the hill withdrew east across the river below abandoning a supply dump containing about 600 tons of food and ammunition and some cattle. The ammunition included 200 rounds of 4.1-inch ammunition for the remaining Konigsberg guns and 300 shells for other guns. The 3rd Battery South African Field Artillery deployed on the river bank and supported a crossing by part of the brigade headed by the 5th South African Horse which reached a ridge on the east side of the river. Captain Bloomfield’s Scouts were deployed forward of the ridge but the other South African troops on the ridge were halted by heavy fire from higher ground to their front and from a defended farm to the north. Two German field guns came into action east of the farm. However von Lettow’s observers on the flanks of the Ulugurus had seen the dust cloud made by Enslin’s brigade and on the evening of 23 August von Lettow despatched a formation under Captain Otto (23rd and 24th Field Companies, 14th Reserve Company, 1st and 6th Schutzen Companies and a 6-centimeter field gun) to Mlali. Otto arrived shortly after Enslin and immediately turned the German defence into attack, making Enslin withdraw his troops on the ridge back across the river. The German supply dump was blown up as the South Africans moved back. Enslin then moved his artillery battery further north along the river bank to cover his left flank. The South African Scouts had been left in an exposed position without supporting fire, and as Captain Bloomfield saw that the enemy were working round his flanks he withdrew his men back towards the South African main body on Kisagala Hill. By now von Lettow himself had arrived on the scene with more Field Companies and the Scouts were subjected to intense machine gun fire. One of the Scouts was killed and five others including Corporal D.M.P. Bowker were wounded. Captain Bloomfield ordered a withdrawal and detailed a two-man carrying party for Bowker. However on arrival in safe ground Captain Bloomfield saw that the Corporal responsible for carrying Bowker had refused his duty and had come back alone stating that the enemy fire was too hot. Two other Scouts were ordered by Captain Bloomfield to return for Bowker but they refused to go. Captain Bloomfield, accompanied part of the way by Sergeant Theron, crawled and ran back about 400 yards (365 metres) under heavy machine gun fire until he reached Bowker. Here he found the other man detailed for carrying duties, Scout Hurley, with Bowker and another Scout named Trickett. Hurley and Trickett were not strong enough to move Bowker who was a big man. Captain Bloomfield, himself smaller than Bowker, put the wounded man on his back and, sending Hurley and Trickett ahead, crawled back with his burden using what concealment he could find from the enemy machine guns. On four occasions Corporal Bowker urged his rescuer to abandon him to his fate but Captain Bloomfield successfully and very gallantly carried Corporal Bowker back to the horses. Here, due to enemy fire and confusion, Bowker was nearly abandoned again, as Captain Bloomfield was too exhausted to carry him further. Hurley obtained a horse for Bowker but was wounded himself, and Sergeant Theron came forward with another horse for Hurley, allowing both the wounded men to be removed to safety and medical attention. Brigadier General Enslin decided to stay on Kisagale Hill throughout the next day, 25 August, waiting for Nussey’s brigade. The Schutztruppe put heavy fire down on Enslin’s troops but von Lettow states that the ground was too broken for swift decisive manoeuvre, and during the night of 25-26 August the Germans withdrew south along the narrow path that led south to Kisaki. Before leaving they destroyed two 8.8-centimetre field guns that were too large to be pulled down the path. Nussey’s brigade arrived on 26 August but was too exhausted to move further and needed rest. General Smuts’ plan had failed as von Lettow had no intention of being forced into a fight against the three British divisions. As described a large part of the Schutztruppe withdrew along the western flank of the Ulugurus. Captain Stemmermann’s Detachment (3rd, 14th, 18th and 22nd Field Companies) withdrew down the eastern flank of the mountains taking with it a Konigsberg gun, a 10.5-centimetre howitzer battery and ox-carts. Abteilung Boemcken withdrew directly southwards along a trail through the Ulugurus that the British had no knowledge of bringing with it several hundred pack-donkeys. The Germans utilised 1,000 African former forestry employees from the Morogoro area to carry loads down to Kisaki where they re-grouped. A supplement to the London Gazette dated 29 December 1916 announced the award of the Victoria Cross to Captain Bloomfield. Capt. 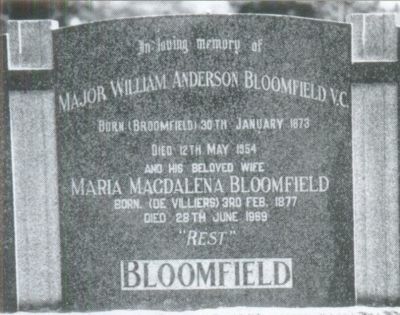 William Anderson Bloomfield, Scouts Corps, S. African Mtd. Bde. For most conspicuous bravery. Finding that, after being heavily attacked in an advanced and isolated position, the enemy were working round his flanks, Captain Bloomfield evacuated his wounded, and subsequently withdrew his command to a new position, he himself being amongst the last to retire. On arrival at the new position he found that one of the wounded—No. 2475 Corporal D. M. P. Bowker—had been left behind. Owing to very heavy fire he experienced difficulties in having the wounded Corporal brought in. Rescue meant passing over some 400 yards of open ground, swept by heavy fire, in full view of the enemy. This task Captain Bloomfield determined to face himself, and, unmindful of personal danger, he succeeded in reaching Corporal Bowker and carrying him back, subjected throughout the double journey to heavy machine-gun and rifle fire. This act showed the highest degree of valour and endurance. On 8 February 1917 Captain Bloomfield was Mentioned in Despatches. 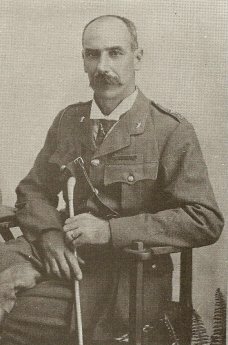 After most of the South African troops had been repatriated from East Africa in 1917 because of poor health, Captain Bloomfield volunteered to serve in France where he was promoted to Major. He died on 12 May 1954 and is buried at Ermelo, South Africa. In The War in Africa and Palestine room in the Delville Wood Museum, Longueval, France there is a photograph of Captain W.A. Bloomfield VC with an abbreviated citation. Official History. 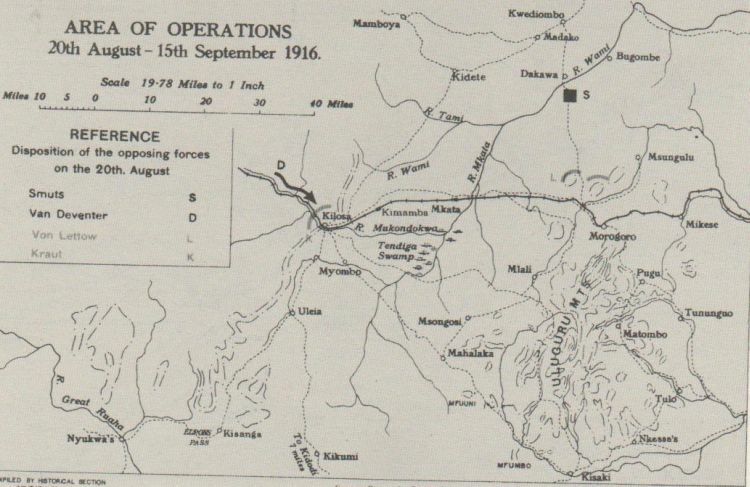 Military Operations East Africa August 1914 to September 1916 compiled by Lieutenant Colonel Charles Hordern. Official History Of The War. South Africa & The Great War 1914 – 1918. Symbol of Courage – A Complete History of the Victoria Cross by Max Arthur. They Fought for King and Kaiser – South Africans in German East Africa 1916 by James Ambrose Brown. The Journal of the South African Military History Society Volume 10 Number 3. My Reminiscences of East Africa by General Paul Von Lettow Vorbeck. Die Operationen in Ostafrika by Ludwig Boell.